Just when we thought we’ve seen everything from Nokia and their R&D section, we stumble upon this Morph concept, revealed today and created by Nokia Research Centre and the University of Cambridge. The device uses advanced nanotechnology and it’s a flexible handset, transforming into any shape you want it to. It can be seen at The Museum of Modern Art in New York till May 12. It’s made out of flexible materials, features transparent electronic parts and best of all, it cleans itself! E-paper and Sony’s flexible display are so obsolete once you get to see this baby in action. Imagine turning your phone into a flat surface and then turning it into a normal handset, at the exact time you receive a call. Nokia’s technology involves the use of 10.000 transistors that fit on a insect’s hair, plus Morph includes highly sensitive sensors that detect chemical compounds in the air and analyze the smells you can perceive. Also the handset seems to use solar energy, as its primary energy source. As for the self-cleaning part, the surface of the device is superhydrophobic, making Nokia’s phone extremely dirt repellent. Did I mention that it features a haptic surface, which takes touch control beyond any imagination? The last detail about Morph is for the ladies out there, who’ll seemingly be able to wear this beauty on their wrists, by turning the flexible nano-based fabric into a bracelet and using a wallpaper that makes it look like a real one. 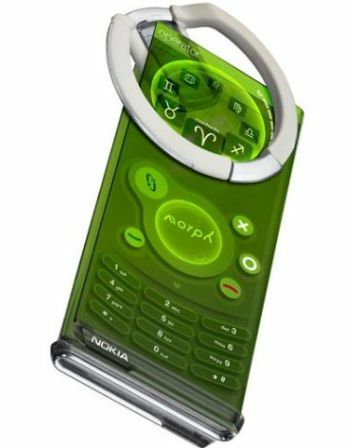 Too bad we’re only going to see such a device at least 7 years from now, but it’s good to know that our future is green and that Nokia intends to stay on top, in the mobile industry.